With more people getting to where they need to go via pedal-power, bike thefts have suddenly become a higher-profile crime. Two Catholic high school students have a different story than the one told by the bike messengers. The teenagers say 20 men on bicycles robbed them -- took their backpacks, cell phones, and clothes -- and left them in their underwear. The bike messengers have a different take; there weren't nearly 20 of them, and they were simply giving the boys a comeuppance for participating in the rising wave of Los Angeles bike thefts -- up 29% in 2009 to almost 2,000 reported robberies. With more people choosing to ride instead of drive in the traffic-choked streets of LA, and elsewhere, the theft of a bicycle weighs much heavier on a man's (or a woman's) shoulders. 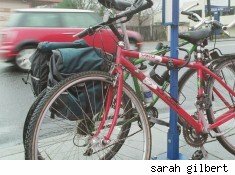 Bikes, without license or insurance, are harder to trace and harder to replace; thefts don't carry as much judicial weight as those of cars, often failing to trigger a felony-level punishment. And, given the vastly different market, are far easier to sell on the streets or to second-hand stores for cash -- usually 5% to 10% of the retail value. Most municipalities have no requirements that pawn shops and thrift stores check ID or record details of walk-in bike sales, making them a sweetheart deal for criminals and their recovery so unlikely that many victims never bother to report their theft. In Amsterdam, where a huge percentage of the traffic is bikes, theft is so rampant that the city employs dredgers to clear bikes -- most of those which were stolen but wrecked, or weren't worth enough to sell -- out of canals. So what's a guy or gal who's chosen to sidestep the better-protected fossil-fuel-powered transportation economy to do? The message from the LA Police Department seems loud and clear: take matters into your own hands. Turn vigilante. Los Angeles Police Lt. Paul Vernon tells the LA Times the story of the bike messengers' escapades, finishing with: "They meted out street justice. We don't condone street justice. They never threatened them. But they made it clear: don't mess with another person's property." He went on, "This incident and the arrests are the tip of the iceberg when comes to people stealing bicycles." You don't condone it, hmmm? Lesson number one of "police not condoning behavior" is not to publicize it. If you really didn't want other citizens stepping up to the plate and stripping bike resellers to their boxers? You wouldn't have made any public statements whatsoever. In fact, this is a big case of he said/he said; police are obviously choosing not only to believe the bike messengers by repeating their version of events along with a statement right out of a comic book, or a bicyclist's version of gangsta rap (They meted out street justice, bah-boom, bah-bong), but to unsubtly call on others to do the same. It's the tip of the iceberg. And what's under the surface? You and your band of bicycling brothers, shaming and leaving the thieves helpless. I'll say the same thing as the police do: I don't condone this. Wink wink. But if you're a bicyclist, like me, you've shaken with rage when someone stole the sole method of conveyance of a single mom, a family dad, a kid proud to get himself to fourth grade on his own, a guy who makes his living riding that bike a thief would trade for drugs worth $25 or $50. Leaving a suspected bike thief mostly naked and trembling on the mean streets of LA? It's way better than what the police can do. But is it justice? I'll let you answer that for yourself; my answer, like Police Lt. Paul Vernon's, is right between the lines.